When moons march across the face of Jupiter, it looks pretty amazing. So, when word got out that the three largest moons of Jupiter were marching all at once in a rare triplet-transit event on Jan. 23, people got very excited. Even NASA and the European Space Agency turned the Hubble Space Telescope’s cameras on Jupiter to get a piece of the action. Now, the images are out and they do not disappoint! Above, is one of the breathtaking color images that Hubble took. 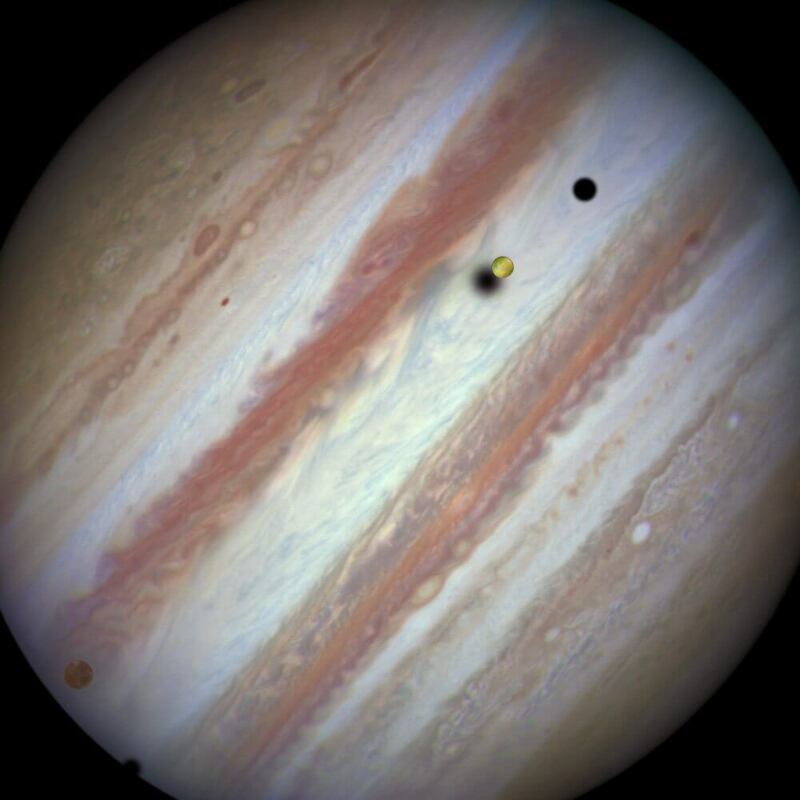 Rarely do we get a chance to see three moons transit, or cross in front of, Jupiter simultaneously. In fact, a triple-transit like this won’t happen again until Dec. of 2032. Hubble took multiple pictures of the event. The image below marks the start of the triple-transit as Jupiter’s moon, Callisto, embarks on its crossing, shown in the lower left corner. The yellow moon you see in the middle is Jupiter’s volcanic moon, Io. And the dark circle in the upper right is the shadow of the icy water world, Europa — the actual moon is not visible in the photo. By the end, Europa’s shadow has disappeared and the moon slowly marches into view in the lower left corner of the image below. Comparing the pictures below and above, you’ll see that Io traveled significantly farther than Callisto during the event. That’s because Io is the closest of the three moons and, therefore, orbits the fastest.